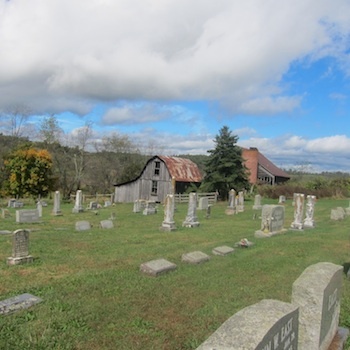 I walk through the churchyard of Fairview Methodist Church in Rural Retreat, Virginia, among headstones carved with familiar names. These are people who were a part of my childhood. They helped me grow up. Their lives formed a network around mine and I was woven in among them. I eavesdropped on their stories. I was the curious child’s version of my grandmother, one hand resting over the mouthpiece of the wall-mounted telephone, the bell-shaped receiver to her ear, listening in on the party line calls. She – and all the other ladies who did the same thing – fooled no one. The man who was “talking to” (courting) my mother’s cousin would say a proper goodbye to his beloved and then bid a cheerful goodnight to her aunt. When someone called the family doctor in such agitation they failed to identify themselves before hanging up, the doctor just said, “Who was that, Mamie?” No one minded. It was how they knew what had happened so they could take care of one another. I played the piano in the little white-frame church. I got to choose the hymns. I would say the numbers to my dairy farmer cousin, who would beam at me with his sun-reddened face and announce them triumphantly – “What a Friend We Have in Jesus,” “The Old Rugged Cross,” “Sweet Hour of Prayer.” Many of those who now lie beneath the stones sang behind me, glancing sideways to see who was sitting where and wearing what. The voices were cracked and hearty. I hear them still. I learned about death in this church – that the men, strong from farm work, would shoulder a casket and the women would bring food. Once I made a checkerboard cake, frosted it, and decorated it with chocolate leaves. I wanted it to be auctioned at an ice cream social to great acclaim, but somebody died and the grownups needed it. I was crestfallen until it was explained to me that more people would see it at the bereaved house than at the cake walk. For years I romanticized this place, its name, the beauty, the dreaming I did here. My memory retains the smell of the air, the sound of chickens in the yard or crows in the woods, the feeling of running downstairs on a cold morning to a warm kitchen and a breakfast of sausage and biscuits. But then I grew up and moved away. My grandparents died and, years later, my parents. The house was sold and is no longer a place of hospitality. I returned not with my blood family but with my old friend who did his own growing up only a few miles away at a farm where we would later receive a warm welcome. Meanwhile I had to make my peace. I had bought two bouquets in Sparta that morning (“Simple, seasonal,” I had said, cuddling Rosemary, the shop’s gray kitten.) Mark brought them to me from the car. The bond we have, he and I, had been reinvented by a shared trip to Vietnam where he had served. We were growing accustomed to witnessing one another’s pilgrimages. He knew I had broken with my family over whether secrets should be spoken. I was not present with my sisters when my mother’s ashes were buried. Returning, walking the land, telling stories, was my way of reaching toward acceptance. My great-grandmother for whom I was named lies here – Susannah Hawks. The name on her headstone is “Sue,” a name I have never allowed anyone to call me. I always wanted to be “Susannah” but now I am “Susan.” I laid one bouquet for my parents and then one for my grandparents. I said goodbye. We drove past the curious cows and down the road. That we must always cherish, and reject, the dead. I am so sorry we missed you ,as I am just now reading my e-mail one being from Pastor Henley leaving me your message of your then pending arrival.I hate i missed such an opportunity.Please come and visit again soon and i promise to open the door for you. Thank you so much, Wanda. I will look forward to meeting you. grateful for a reaction if you had time. Thank you, Penny. Wonderful to hear from you. Who is your mother’s father? Seems like in such a small place as Rural Retreat I ought to recognize the name. My thesis was very interdisciplinary and relied on theories of perception to understand how a medieval portal worked – in the 12th century and now. I will certainly have a look at your blog. Thank you. You are currently reading The Dead at Susan R. Dixon.